This 4mm Astrea Tungsten Ring is exclusive to Tungsten Fashions. 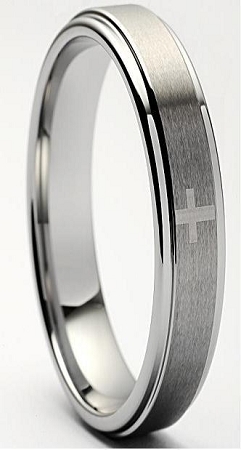 There are actually 4 crosses on this ring, only one is shown here on this photo. that will never dull along the sides. This ring also comes in a 7mm matching set. A: There are a total of four crosses that go around this band. Q: what kind of metal are the tungsten womens rings? A: The rings are made out of Tungsten. Tungsten is the type of metal. Just like titanium rings are made of titanium, tungsten is made out of tungsten. Tungsten will never tarnish, scratch or bend. The biggest difference between tungsten, besides how strong the material is, would be the weight. Tungsten is going to be a bit heavier than most rings. I hope this helps. We are here to answer any other questions you have. Q: is style 2747 a womens ring? I ordered A 10 should have been a 9 1/2 but she likes it.So i will get it right the next time.More importantly she did not have her usual allergic reaction to metals.Thus i will be ordering again. Response was quick and correctly done. Love my ring! This ring is beautiful. I will enjoy wearing it even when I am long gone. Ring looked just like pictures. Unfortunately, it was wider than I expected so had to return it. Return policy was easy & online support was great! Really nice ring; thought it would be a little wider but I still really like it. Going to order a matching one for my husband! Excellent quality l, speedy delivery and true to size fit. Rings are great. The quality is perfect. They fit good. This company is outstanding when it comes to shipping. What a great addition to our great day, this ring is perfect. Allergic to gold so after 22 years of marriage I ordered a Cicero 9mm brushed. Ordered wrong size it was promptly replaced. I've had no allergic reactions to this metal and wear ring everyday . Everybody that sees it seams intrigued by it so its become a conversation piece as well. Wife was upset that our rings were differant so for Christmas one of her presents was a Astrea 4mm with a inscription on inside of band ring came in 7mm and was promptly replaced. I thought she would put in her keepsake box which she didn't she likes it so much she wears it . Now she has me wearing a ring and hers looks like mine she's happy and all married men know what that means. Great quality!! Easy exchange for a different size at no cost! !